A defibrillator is a pager-sized device that is placed in your chest. It watches your heart beat and if you have a life-threatening rhythm it will shock your heart and potentially save your life. These devices are useful for preventing sudden death in patients with known sustained ventricular tachycardia or fibrillation. They are also useful in preventing sudden death in some high-risk patients with a weak heart. Once the procedure starts you will be given a local anesthetic to numb the skin. A small incision will be made below the collar bone. The doctor will place the defibrillator leads into the appropriate chambers of your heart. The device will be placed under your skin. The incision will be closed with suture. These sutures will absorb over a period of time and will not have to be removed. Following the procedure, you will stay overnight for monitoring. Once you are completely awake you may eat and drink. You will be on bedrest for a period of time which will be determined by your physician. Your incision may be sore. Your doctor will discuss how to best manage your pain, including medication options. Most patients are discharged home the following day with a list of activity restrictions and incisional care. You will also be given a transmitter box to connect at home. This allows the Missouri Heart Center to monitor your defibrillator wirelessly. You will be given a card with your defibrillator information and you should keep this in your wallet or somewhere safe. 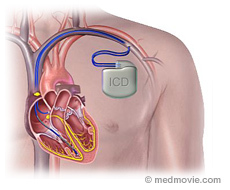 Will an ICD cure my heart rhythm problem? No, to cure means to permanently eliminate the condition and that’s not what an ICD does. Rather, and ICD acts instantly if your heart rhythm changes for the worse. It treats a problem each time it occurs. Most patients who have received shocks from an ICD describe them as startling, jolting, and unsettling; but not painful. After the device is implanted, can I resume normal daily activities? In most cases, once the ICD begins to control your heart rhythm, life can return to normal. You should be able to return to work, school, and usual activities including driving, sexual relationships, and exercise. How long it takes to resume normal activities depends on the individual patient and other medical problems they may have.